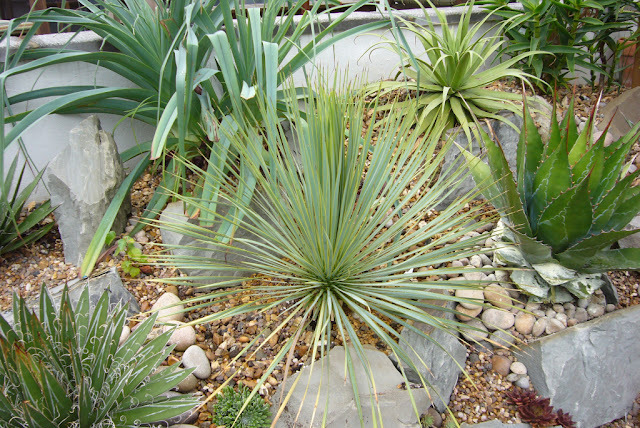 There are two large yucca rostratas in the main succulent rockery and while one has settled, the other has being going down hill. I have been putting it off, hoping more water and food would kick start it. Sadly not and the time has come for it to be dug up. It didn't take much, there were no roots at all and the first sings of rot. But you never chuck a yucca away, so it is into intensive care for this one hopefully to re-root and get back to its best. Doesn't look good does it. I'll move it to the greenhouse over winter I think anything to give it a bit of a start. Trunked plants like this a expensive and can't afford to loose it. Plus it was a real feature so need it back. The problem with removing plants to bring the back to health is they leave a space. What to do? It could be left empty under the assumption the plant will back next year. The space is very prominent and it is going to be at least a year until the plant is looking anywhere near healthy again. So replacement plant it is. I purchased two smaller yucca rostatas a little while back specifically for this purpose. Placing one of them into the spot showed it was not going to be as simple as a straight swap. 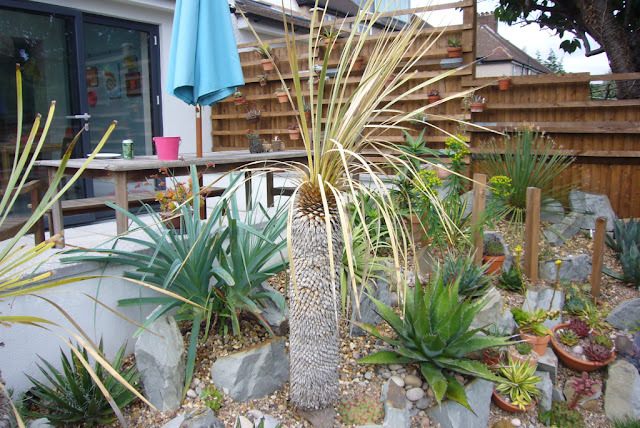 With no trunk the area is too messy, it just doesn't work with the kniphofia caulescens behind it. 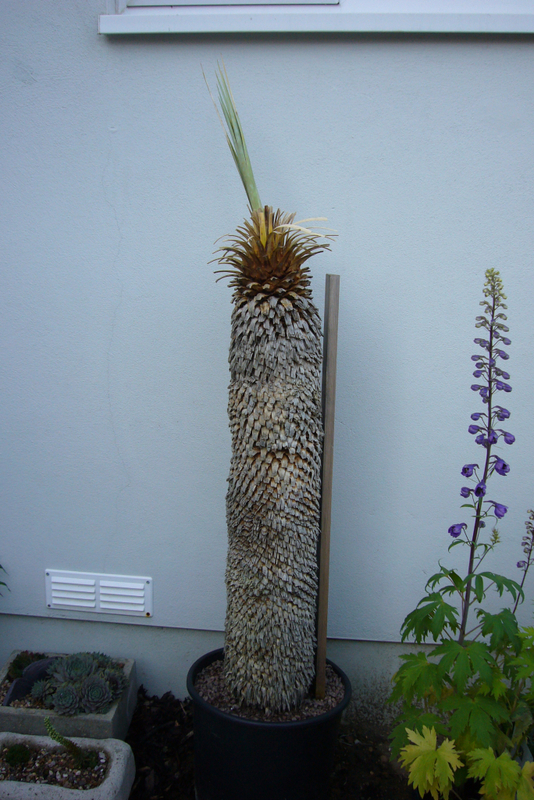 I have been unhappy with that kniphofia anyway, it hasn't flowered and continues to get bigger. I expected it to be smaller, apparently not. So it was going to be moved anyway. One problem solved, but what to put in its place. I'll solve that one next year, it gives an opportunity to do some end of year sales shopping. So yucca planted, with enough time to settle in before winter. It feels a little strange to already be thinking about winter and if it is ok plant or not. 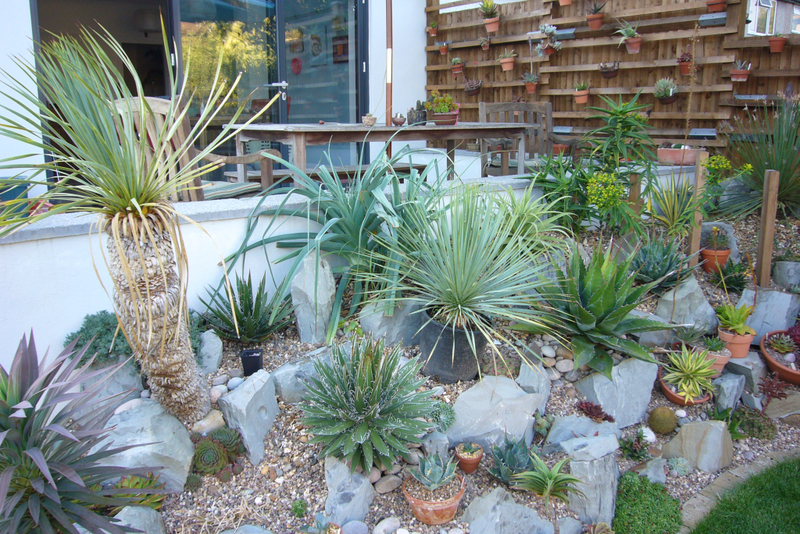 It makes a massive difference though, the last thing succulents need is to be planted and then straight away get frosts or cold and wet. Now keep you fingers crossed for the sick yucca. It needs all the positive thought it can get. Very sorry to see your Yucca in dire straits. Thinking positive thoughts on your behalf, hoping it recovers. The rest of that bed looks beautiful and quite healthy. The way you arranged the larger rocks looks really good. Thank you. The rest of the bed is doing really well, loving that it warms up very quickly in the sun. Ugh, so sad. Healing thoughts to Mr. Y and yes...that Kniphofia would have also driven me crazy with the smaller Yucca rostrata. Thank you. I think i know what I'm going to replace the kniphofia with, but am waiting to see if anything better comes up in the sales.